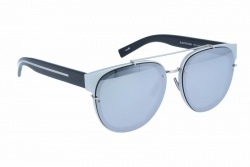 Dior Black Tie sunglasses are the cornerstone of Dior Homme line. Because we cannot forget about men, it is necessary to take a look at Dior collection for men. Dior Homme is the masculine line of Christian Dior’s fashion house. Conventional and minimalist styles are gathered together in these models. Moreover, the range of colours provided by the brand is a classic one, with colours such as black, grey, blue, tortoiseshell or chocolate. In this collection we can find retro-style eyewear such as models 179 FB8 54 or 180 2WC 57 15, as it happens too with some models of the sunglasses collection, 181 JO5 54 19 or 77 FB8 55. There are some designs a little bit modern than the previous ones, with aviator or rectangle-shape frames like the model 165 807 58. Besides all the models are suitable for prescription glasses. This collection presents high-end glasses, manufactured with high-quality materials, which perfectly fit with everyone’s look. Buy now your Dior Black Tie in our web.